There two kinds of apple watch set up (we’ll cover both). They both involve pairing the watch with an iPhone either As a new watch or restoring Apple Watch backup. Follow these steps to successfully complete setup Apple Watch and pair to iPhone. Start by Turning on the Apple Watch by a long press on the side button until the Apple logo appears. Keep the iPhone in close proximity to the Apple Watch so as to enable Bluetooth connection. On the Apple watch app and tap start pairing. When a connection is established, a swirling animation is displayed on the Apple Watch screen while a frame appears on the iPhone screen. Move the iPhone over the apple watch and contain the watch within the frame on the iPhone screen This action will prompt the next step automatically. Once the pairing is done, proceed to choose either Restore from Backup or New Apple Watch Set Up. This option is for new Apple watch owners with no existing back to restore. Not much to do on the initial screens. Tap to agree to Apple’s terms and conditions. Next, the Watch app will sign into your Apple ID account or you might be prompt to sign in. Sign in and tap OK on the Shared Settings screen. Next, create a passcode to the Apple Watch. To use a basic, 4-digit code. Enter your preferred code twice on the Apple Watch. Using a Complex and Secure Code on Apple Watch. tap Add a Long Passcode. Enter the code on the Watch. You can also choose to set no Passcode. Tap continue on the Health features screen on the iPhone watch app. The next screen is for Apple Pay set up. If you use Apple Pay on your iPhone, all you need to do is re-authorize your card. On the other hand, If you don’t you can either choose to Continue to set up Apple Pay or Set Up Later on the Apple Watch App. The safety features are explained on the next screen. Your Watch will inherit settings from your iPhone such as emergency contacts and health and activity goals. If no set up is found, you might be prompted to set them up here. At this point, configure the watch cellular service. By Tapping set Up Cellular. The cellular setting involves a set-up process for the phone company providing cellular service on the Watch. Follow the onscreen prompts until cellular setup is ready. Then tap Continue. Now you can install Apple Watch apps provides mini-versions of apps on your iPhone or Choose Later. After all the settings have been selected, now your iPhone and Apple Watch will begin to sync. This process might take a while. A sound will notify you when the process is complete. When the syncing is completed, tap on the Watch’s Digital Crown to start using it. 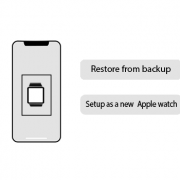 Just follow these steps for Apple watch set up from backup. 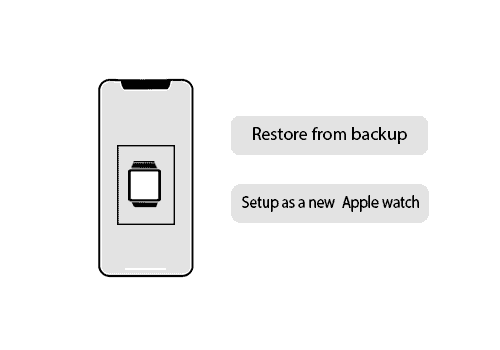 On choosing restore with back, The Apple Watch Set up on the iPhone will display available backups. proceed to choose the one you wish to install. On the next relevant screen, Agree to Apple’s terms and conditions. Then sign into your Apple ID and tap OK on the Shared Settings screen to continue. Next, create a passcode or skip to continue. The next screen gives details about health support features on the Apple watch. Study the features and then tap Continue. You can choose to add Apple Pay Either by tapping to Continue to set up Apple Pay or Set Up Later on the Apple Watch App. Wait for the Apple Watch set up to completely sync to the iPhone Apple watch app. You will be notified by vibration and a sound after syncing. Then press the Digital Crown to start using your Apple watch. Apple Pay on Apple Watch – How to use it to Pay Cash Big Data is Technology for the Future. Find out Why?